A debate on prison policy in the House of Lords last week "showed how much goodwill there is for the new justice secretary", according to the Conservative backbench peer who initiated the discussion. Lord Fowler said policies being introduced by Michael Gove, who also holds the post of Lord Chancellor, "give more hope for advance in prison policy than anything I have heard for many years". From the Labour front bench, Lord Beecham said: "It would be churlish not to welcome Mr Gove's appointment as Lord Chancellor, although almost anyone would have been an improvement on his predecessor". Chris Grayling was Justice Secretary and Lord Chancellor from September 2012 to May 2015, the first non-lawyer to hold the post for more than four centuries. As such, he was never going to have an easy ride from the legal profession in his first cabinet post. He was also required to save large sums of money from the Ministry of Justice budget, leading to cuts in legal aid and colourful protest meetings by lawyers. Some lawyers also objected to his planned human rights changes, although in this he was merely seeking to do the prime minister's bidding and these were never implemented. But some of Mr Grayling's less well-known policies, such as restructuring of the courts in England and Wales, are being carried through by his successor. One reason Mr Gove has earned the respect of his political opponents is his willingness to reverse many of Mr Grayling's least effective decisions. There is speculation the next policy to be abandoned will involve the award of criminal legal aid duty contracts. These contracts, under which solicitors agree to cover police stations and magistrates' courts in England and Wales, are the gateway to legal aid work for law firms. To make up for cutting solicitors' fees by 17.5% over two years, the number of contracts was to be reduced from 1,600 to 527 - making each contract much more valuable. But the Ministry of Justice had to postpone the new contracts - which were meant to take effect this month - after solicitors launched legal action alleging the allocation process had been unlawful. If Mr Gove does decide to put pragmatism ahead of ideology, it won't be the first time. A couple of months after his appointment last May, the former education secretary lifted restrictions on the number of books that prisoners could keep in their cells. Also last July, Mr Gove scrapped plans to spend an estimated £85m building a huge prison in Leicestershire for 320 young offenders. Risking a clash with the Foreign Office, the justice secretary pulled out of a £5.9m prisons deal with Saudi Arabia. This had been set up under a commercial arm of the Ministry of Justice established by Mr Grayling and scrapped by Mr Gove. Last month, the justice secretary abolished the much-criticised criminal courts charge, which Mr Grayling had insisted would make criminals "pay their way". And, this month, Mr Gove supported a 3% pay rise for high court judges, to be funded by increasing salaries for the most junior judges by less than the 1% they would otherwise have received. One reason, he said, was it had not been possible to fill a vacancy in the high court family division last year - at a time when Mr Grayling was insisting that implementing changes recommended four years earlier would have increased the total pay bill by an unacceptable 2%. 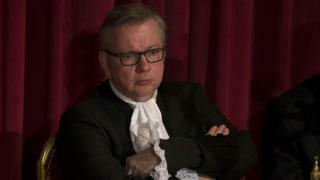 Despite praise for his prison policy, Mr Gove was criticised by a former law lord last week for continuing to detain 4,500 prisoners given indefinite terms of imprisonment for public protection (IPP) under a schemed abolished in 2012. About 3,500 of these IPP prisoners have already served the minimum punishment periods set by the courts. But the biggest difference between the two secretaries of state is the one that is the least obvious: Mr Gove has managed to establish much better relations than Mr Grayling ever had with what the Ministry of Justice regards as its stakeholder groups, notably the judiciary. While well aware they can no longer rely on the lord chancellor being a lawyer, the judges are relieved to find the minister responsible for the legal system in England and Wales is now someone they can do business with.